The index opened positive and stayed in a small range of just 40 points and closed making a DOJI candle at 8650.30, gain of 17.70 points. The broader market was positive with 948 advances to 651 declines. Range for expiry at 8550-8750. 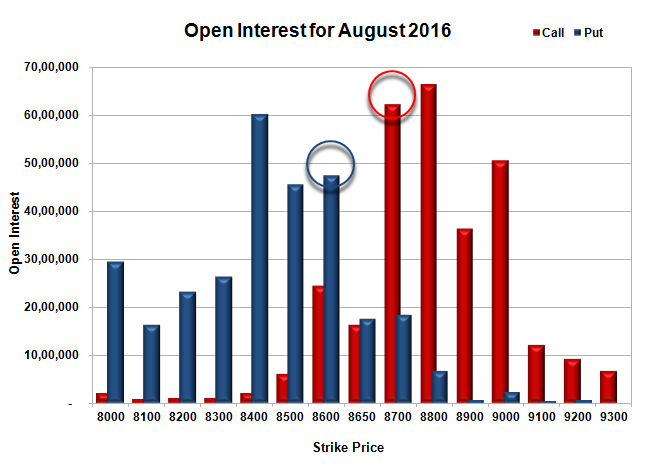 Not much Call option addition with short covering at 8600 and below strike prices. Put option 8650-8600, 8400 added 11.75 lacs OI with profit booking at 8500 and below strike prices. Nifty Open Interest is at 92,94,825 down by 30,56,550, whereas next series added 29.80 lacs with no change in price, mostly roll-over with small short covering. Bank Nifty Open Interest is at 14,56,240 down by 3,53,880, whereas next series added 2.75 lacs with increase in price, mostly roll-over with some short covering. 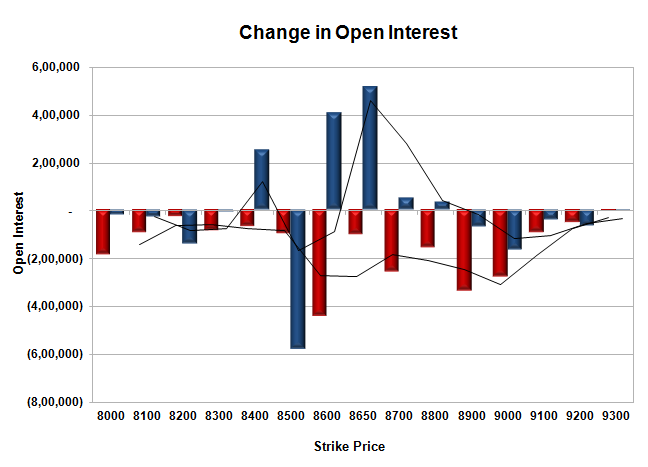 FII’s sold 4370 contracts of Index Futures, which includes net 3520 contracts long build-up and 7890 contracts short build-up, with increase in net OI by 11410 contracts, includes 90120 longs to 94490 shorts for the day. 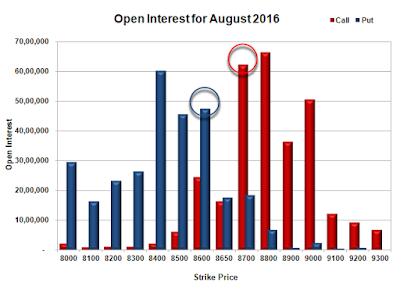 FII’s Index future open contract as on date is 329311 Longs to 96899 Shorts, Net long 232412 contracts. Initial support stays at 8600, with OI of 47.44 lacs and below that at 8500 with OI of 45.57 lacs. 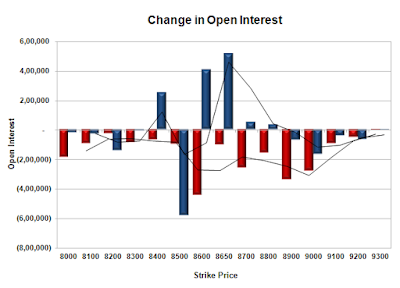 Initial resistance at 8700, with OI of 62.35 lacs and above that at 8800 with OI of 66.35 lacs. 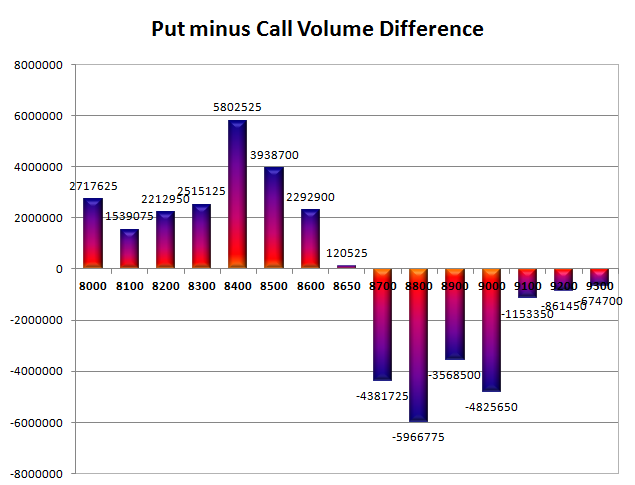 Day Range as per Option Table is 8595 - 8695 and as per VIX is 8589 - 8711 with 8644 as the Pivot.